I am a Certified Sport Throwing Instructor (IKTHOF and KATTA UK) and am proud to say I have introduced many hundreds of people to the sport, and taught throwers who have gone on to compete and win nationally and internationally. 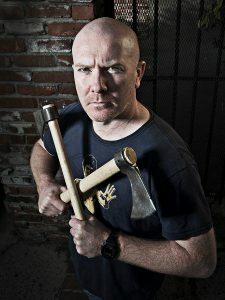 I am a board member and the UK representative of the International Knife Thrower’s Hall of Fame (IKTHOF) and have represented the main European knife/axe throwing organisation, the Eurothrowers, in the US. In October 2010, I became the number 1 ranked IKTHOF knife thrower in the world and set a new World Record with a score of 262! (Subsequently beaten, but it held for a couple of years). In November 2011, I won the IKTHOF Tomahawk Throwing World Championship, set another new World Record with a score of 232 and became the number 1 ranked IKTHOF tomahawk thrower in the world too! Sadly, in November 2013, this score was beaten too. In December 2013, JP Devlin of BBC Radio 4 fame recorded me throwing and talking about throwing for Saturday Live. You can hear it here, about 13 mins in. In October 2015 I was interviewed by Andy Fisher for his excellent series of podcasts for Thronin. This was a very special event because it was the first World Championship event held in and organised by the UK. Very hard work but something John and I had been working towards since the beginning of Knife Club. Qualified for World Championship Axe and Team GB came 3rd overall!